Recently, Willowbrook Memory Care welcomed a group of local school children to join residents in putting together cards and gift bags for the local police officers as part of “Thank a Police Officer Day”. The children made colorful “thank you” cards and the residents stuffed gift bags with candies and other delights. The officers enjoyed the cards and goodies and the children and residents felt that they had done their part to support them. To the casual observer, this might appear to be simply a “feel good” event to bring young and old together. But for experts in the field of dementia this kind of activity accomplishes much more. Studies show that having a sense of purpose is therapeutic for those challenged by dementia. In what is now considered a landmark study, Rush University Medical Center in Chicago conducted a long-term study of over 1,400 senior citizens over a 15-year period. Those who rated high on their “purpose of life” scale had a 30% lower rate of cognitive decline over those who rated lower. How can we use this insight to improve the quality of life for our loved ones with dementia? At our Anthem Memory Care communities, we work closely with our local schools and other agencies to take advantage of opportunities to bring purposeful activities to our residents. These activities often include making care packages for charities, baking with local Girl Scouts and, yes, putting together gift bags to thank our hard-working police officers. Some of our residents, who are able to, even share their talents with others. While it is understandable, it is unfortunate that many continue to make the assumption that an individual with dementia no longer needs a sense of purpose. We all do! 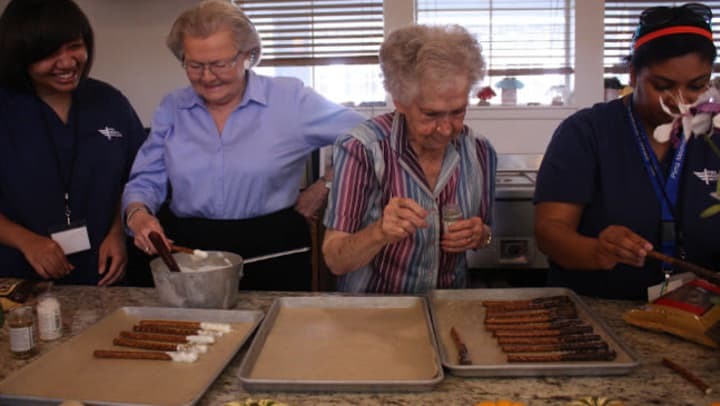 At Anthem Memory Care providing opportunities for our residents to participate in purposeful activities is part of our person-centered care philosophy. It is part of our pledge to treat each person as the unique individuals they are and to always engage with dignity and respect.